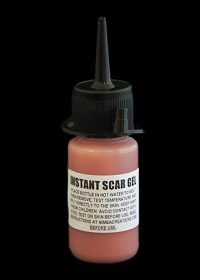 Our Instant Scar Gel is a quick and simple way to create keloid style scars in the skin in minutes! Simply put the bottle of scar gel into a cup of hot water and give it a few minutes to melt. 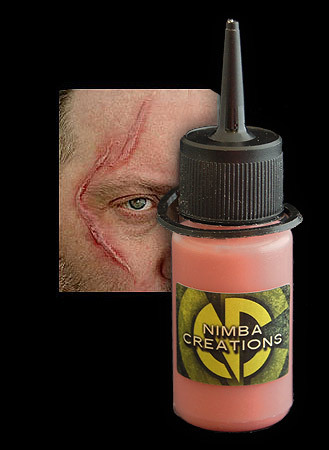 Carefully cut open the top of the bottle and apply the gel directly on the skin – great for fast effects on-set. For an extra strong application, we recommend applying a thin layer of Prosthetic Adhesive to the skin before laying down the gel. Test on small area of skin before use; if any adverse reaction occurs, discontinue use. When melted, always test temperature of gelatine before using on skin. Do not boil. Do not use on broken or sensitive skin. Keep out of reach of children. Avoid eye and mouth areas. External use only. This is so easy and quick to apply and creates an amazing effect. Great price and plenty to cover a large area. Incredible look love it, great value for money.